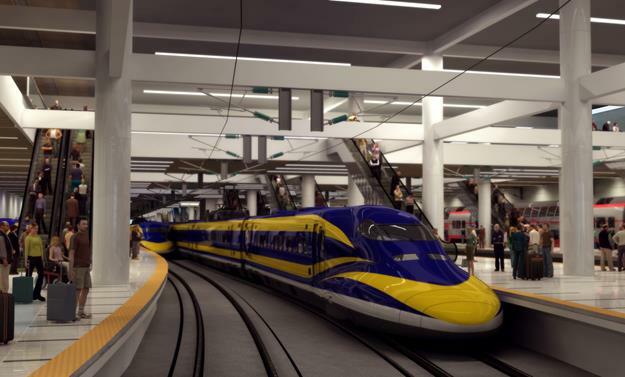 LOS ANGELES – The long-touted dream of a high-speed rail line connecting Los Angeles and San Francisco — using a route that would include a stop in Palmdale — was put on hold Tuesday, with Gov. Gavin Newsom saying that he respects the idea but the project needs a major reevaluation. Newsom said he wants the state to move ahead with a high-speed line between Merced and Bakersfield. According to the California High Speed Rail Authority’s website, the proposed high-speed rail station in Palmdale was to be located near Avenue Q and Sierra Highway, south of the Palmdale Transportation Center (PTC). This station was also to have served the proposed XpressWest high-speed rail service to Las Vegas via the future High Desert Corridor. For more information on the California High Speed Rail and its proposed route, visit: https://www.hsr.ca.gov/. The Governor has called for setting a priority on getting high speed rail operating in the only region in which we have commenced construction—the Central Valley. We are eager to meet this challenge and expand the project’s economic impact in the Central Valley. Importantly, he also reaffirmed our commitment to complete the environmental work statewide, to meet our “bookend” investments in the Bay Area and Los Angeles and to pursue additional federal and private funding for future project expansion. 7 comments for "Newsom dramatically scales back high-speed rail project [updated]"
Typical socialist boondoggle wasting everyone else’s money. Someone should be held accountable (looking at you, Jerry Moonbeam Brown). Labor unions did not support it in Southern California. Too bad as it was their work. Crickets!! Some companies don’t capitulate to pressure by union bullying tactics. Kinkisharyo wouldn’t capitulate so Kathy ‘Job Killer” MacLaren and some phoney baloney environmental group killed their manufacturing plant. It cost hundred of trade union jobs and Kinkisharyo has no reason to stay beyond their current contract. All the people in Palmdale must really be fuming! Especially the Democrats.